When my children were little they always wanted their own playhouse. Unfortunately, the only ones we had available were the hard, outdoor houses. We certainly didn’t want those inside! Sharing Land has some amazing, durable playhouses. They’re not plastic, they are a durable, cardboard that holds up to lots of play. That all equals to tons of imaginative fun for children. I wish they would have had this when my kids were young. 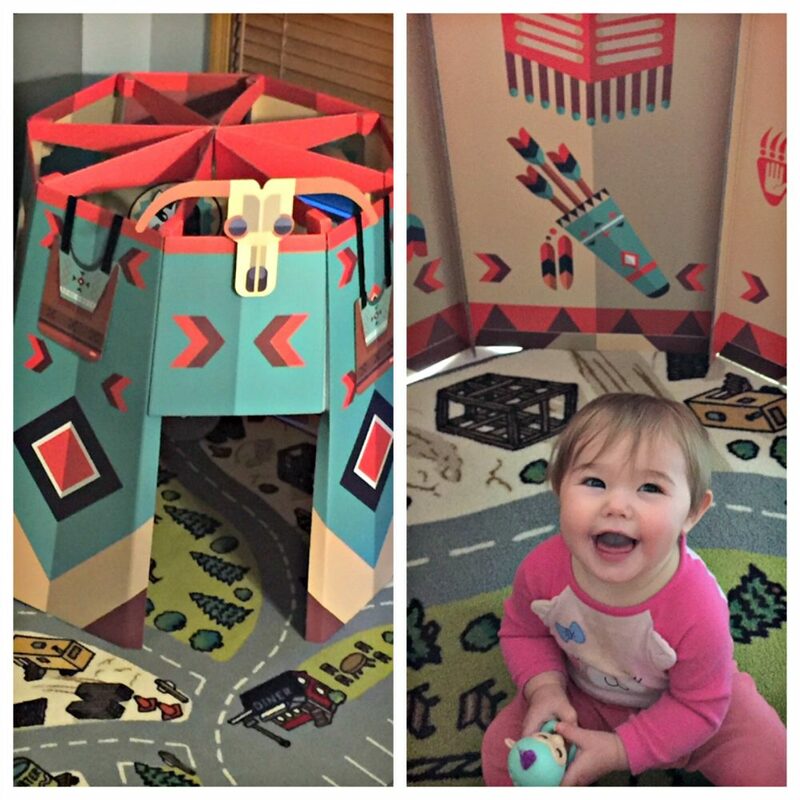 The awesome playhouse I received was the Ancestral Teepee, which comes with lots of fun accessories. My granddaughters were in awe, and to be honest, so was I! This thing is 45 inches tall and 45 inches wide. I am a very big girl and I even fit inside. It’s crazy how much room there is. The accessories are so cute. 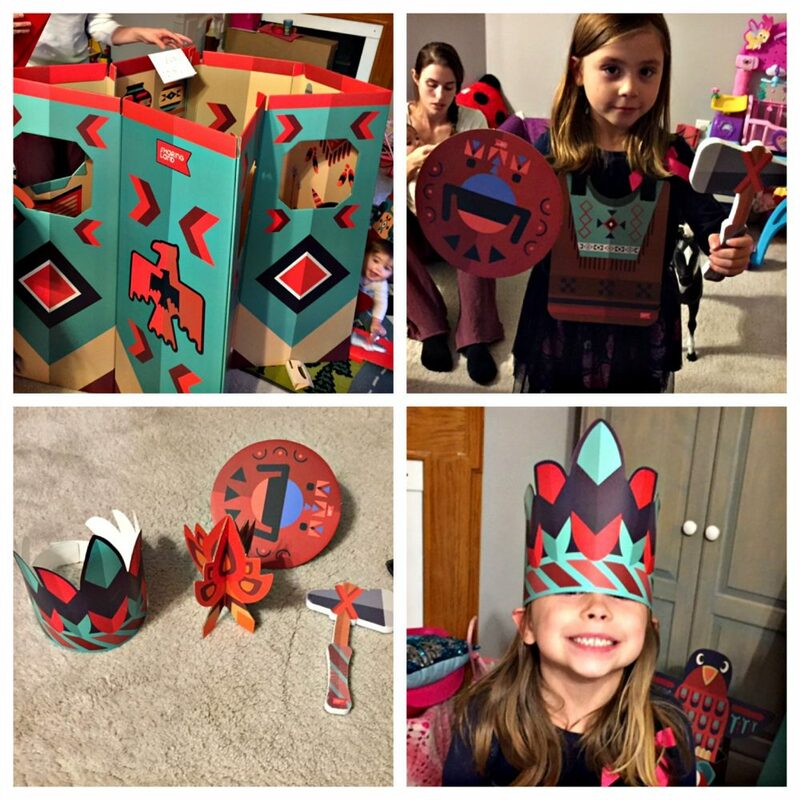 It comes with 2 tomahawks, 2 shields, 2 tribe vests, a play campfire, 2 “feather” headdresses, a dream catcher, a bullhead (to go on top) and even a totem pole! Now my granddaughter can let her friend come over and share in the fun. The playhouse itself is beautiful. It has vibrant designs on the outside and even pictures of feathers and animals on the inside. It was one of the easier toys that I’ve put together, that is for sure. All you have to do is bend and velcro! If you can do that, you’re good. However, don’t think that means it will fall apart because it definitely won’t! The frame holds together by hard cardboard pieces, almost like a tree stand (except it holds the top). When I say this is durable, I really do mean it. My one-year-old granddaughter is learning to walk, so she holds herself up on this playhouse. It hasn’t folded in yet and from the look of it, I’m not expecting it to. If you are looking for a unique gift for little ones, trust me, this will give huge smiles this holiday season! The most wonderful part is the price. You would think since it comes with so many accessories and its durability, it would be expensive, but it’s not. The teepee that I received sells for $99.99 (before tax) and there are other playhouses to choose from. If your little one isn’t interested in a teepee, they probably have something that would make them happy.